For years, the Toronto Taxpayers Coalition has advocated for the issues that matter to you: lower taxes, less waste, and prudent fiscal planning. We sent an issue-based survey to Rob Ford,John Tory, and Olivia Chow and we’re pleased to present their answers and our analysis. Click here for gradings, summaries, and candidates’ full responses. We have been at the forefront in pushing City Council to consider key policy changes. One is Cutting the Size of Council; reducing the number of wards from a dysfunctional 44 to 25, matching federal riding re-distribution. One candidate committed to cutting the size of Council while the others are considering electoral reform in the form of a Ranked Ballot. Second, is the grossly unfair Municipal Land Transfer Tax. Our members have spoken: it must be eliminated. While the tax is being phased out, we encourage the Mayor-elect to index the tax to make it more fair or make a portion of the home cost exempt. We’re pleased to see Ford and Tory indicate their support of such ideas, and worry that Olivia Chow would continue to allow home-buyers in Toronto to be unfairly penalized. Third, contracting out garbage collection east of Yonge Street. On this, we again question why Olivia Chow stands apart from fiscally sensible candidates in order to protect public unions over better service at a lower cost to taxpayers. Transit has been the top issue during this mayoral race and, by far, the most contentious. Since the debate began, the Toronto Taxpayers Coalition has supported the over-due Scarborough Subway. It will waste precious political capital to re-open this debate at the start of the new term, and we regret to say Olivia Chow would choose to travel this route. Most mayoral candidates don’t support dedicated, new taxes for transit. Olivia Chow hopes to go cap-in-hand to the provincial and federal governments to request more money for slow-moving bus service, failing to remember there is only one taxpayer. The Mayor-elect will spend next year negotiating new Labour Contracts for the city. City Council must set targets and stick to them, with the focus on achieving greater efficiencies and more productivity with all services. Again, we fear that electing Olivia Chow will bring us back to the labour strife experienced during the socialist administration of David Miller. Olivia Chow’s grade reflects the content of her platform, most of which we cannot agree with, though we commend her for wanting to extend the small business tax cut and her proposal to match immigrant entrepreneurs to existing business. Overall, we want to elect a Mayor that has the economic foresight to drive more Private Investment to Toronto. Some excellent ideas have been debated in this race: reducing red tape for businesses small and large investing in Toronto; cutting small business taxes; promoting technological investment; and fostering the economic environment to create more employment hubs downtown and in the inner suburbs. We want Toronto to be the best city for taxpayers to live in and for business to invest. So Toronto – who do you choose? Ed. note: We contacted the Doug Ford campaign to ask if they objected to our attributing Rob Ford’s earlier answers to Doug Ford. No objection was submitted. 1) A year ago today saw the beginning in a series of natural weather events that placed an unexpected financial burden on the city. What lessons have you taken away from this to better deal with the financial fallout due to aggressive climate in the future? We can expect more severe weather as the climate changes. We won’t be ready unless we recognize big cities have unique needs, and stop demonizing responsible public investment, which is essential to keeping infrastructure modern, protecting vital tree canopy, and ensuring that emergency services work. The lesson I’ve taken away is the need to mitigate climate change and its impacts. 2) Do you feel that cutting the size of Toronto City Council would improve how Council operates? A mayor with a proven track record working well in municipal government, and an end to the current circus, is the best way to improve things. Municipal government is the closest to people and affects daily life more personally than other levels. Having accessible councillors is imperative, and so while I, too, wish things ran better, I place a higher priority on local representation. I can’t agree. 3) What is your stance on introducing new dedicated taxes to pay for transit expansion in this City? I’d welcome provincial or federal moves to dedicate some of the taxes our city pays for our pressing needs, which we share with other big cities. On the municipal front, the property tax base is already stretched beyond what it was designed for, and is not based on ability to pay. Accordingly, I don’t support dedicating it—our primary tax, by far—for any one need. I’ve sat on the budget committee and know the significant costs already borne by property taxes. David Soknacki has also served on it, and it’s no accident we share the most fiscally responsible policy: saving $1 billion we don’t need to spend, and building transit in Scarborough four years faster with four more stops. All other candidates support Rob Ford’s fiscally irresponsible approach to this issue. 4) Transit planning has not progressed as it should over the past few decades because of revisiting past decisions and reopening previous debates. How do you feel we can best improve the transit planning process in Toronto? Rob Ford, supported by John Tory, has indeed delayed transit. World-class above-ground rail in Scarborough would be ready by the Pan Am Games if we hadn’t wasted four years. They would all spend the next four years cancelling contracts, doing the studies, and buying properties, all of which entail changing the existing master agreement with the province. So it’s welcome you support keeping the plan that’s in place, with studies all complete, contracts signed, and still the basis of the master agreement with the province. It’s good to hear that like me, you’d start building above-ground rail next year. It would be ready four years faster, with four more stops to serve more people—and it would save the city $1 billion. It would also save more than $30 million a year in operating costs. We need expert-led planning and an integrated plan, very similar to the existing master agreement between the city and province. We don’t need misleading debate on an issue too serious to treat so dishonestly. Here, I speak about Mr. Ford comparing world-class, above-ground rail to a streetcar; and Mr. Tory pretending his new transit priority is the same as the one he said drove him to run when it so clearly is not. 5) Where would you find savings in future budgets? List your top five specific priorities for savings. My top priority for saving is not spending $1 billion we don’t have to (and another $660 million in federal taxes we don’t have to), to deliver transit four years later, with four fewer stops to Scarborough. It is curious this issue, with its significant fiscal impact, is overlooked in your questionnaire. Why is that? 6) Are you in favour of cancelling the Land Transfer Tax in the City of Toronto? 7) In upcoming labour contract negotiations, how would you achieve agreements that are fair for both City employees and taxpayers? Collective bargaining. I value the services our city provides, and the people who provide them, such as the hydro workers who worked around the clock to restore power after the holiday ice storm last year. Valuing the services people and communities depend on every day, while keeping property tax increases reasonable—around the rate of inflation, as I did on the budget committee—can both be achieved through collective bargaining. 8) How can affordable housing be best managed in this City? Should the City be playing a different role than it is now, if it were to play any role at all? Hospitals didn’t work better when the public wasn’t involved, and neither does affordable housing. The city certainly has a role, and I’m the only candidate with an affordable housing plan so far. It proposes a change to how the TCHC is managed, through a pilot project that would empower residents and stakeholders through a separate, public corporation—focused on specialized seniors’ housing. I’ve also released practical plans, supported in the private sector, to build 15,000 new units of affordable housing. I would also help our existing 1,200 residential towers to improve, where much of our cultural and economic diversity is found. 9) Do you place a priority on paying down the city’s debt, and what plan would you put forward to eliminate our debt quickly to minimize interest payments? How quickly can you eliminate the debt? Our current debt cap, a goal of council, is 15%. I won’t add to it. While it’s much lower than federal or provincial governments, it also sits on a property tax base that doesn’t grow with the economy like income or sales taxes do. Yet, the province ended operating support for the TTC, which is largely responsible for us having North America’s costliest transit pass. The damage was compounded by ending support for public housing as well. that municipalities own and maintain has more than doubled. Indeed, we’re now responsible for about 60% of Canada’s overall infrastructure, reflecting growing rates of urbanization. My priorities are better transit, children and fighting the youth unemployment crisis, not making debt promises that no-one can keep. Certainly not while needlessly adding $1 billion to the debt, as both Mr. Ford and Mr. Tory propose to do. 10) How would you encourage more private investment in Toronto? I have set out a detailed economic development plan, to create jobs and fight youth unemployment. For example, we should copy a successful Vancouver program that matches immigrant entrepreneurs with existing business to create a win-win. The new business gets help setting up; the existing one, help and contacts to export. I want to extend the small business tax cut. And I’ve proposed a sensible, proven way to attract investment and jobs by allowing our region to speak with one voice, through an agency called Global Toronto, modelled on successful efforts in Montreal and Chicago. Although Toronto was hit hard by Mother Nature in 2013, I am proud to say the City was ready. We had the reserve funds in place to pay for the millions of dollars in damage the storms caused. Our administration has been focused on replenishing reserves as part of our fiscally responsible approach to Toronto’s finances. Obviously we needed the other levels of government to support us after we incurred over $150 million in costs associated with extreme weather events. We took the lead in meeting with GTA Mayors and appealing to the Province to secure much needed funding. It is essential that Toronto puts money aside in our weather related reserve funds. In this instance, the City’s reserves were prepared. That’s because, we have been replenishing the reserve funds that were depleted by my predecessor for one-time funding solutions to the annual budget gap they had created. Since I took office, we have implemented a number of measures to reduce spending and close that gap, allowing us to invest more money in reserves and other important priorities. Yes, absolutely. I have been pursuing this goal for many years. I have presented a number of motions to City Council regarding this important issue. However, Council holds the ultimate power to implement this change. Countless hours and millions of taxpayer dollars are wasted on endless debates at City Council every year. This is not efficient. I think we can get the job done more efficiently with 25 councillors. I do not support implementing a gas tax or a sales tax or any other transit tax that will harm Toronto’s economy like my opponents would. In 2013, we had a major victory on the transit file. The Ford administration brought Toronto City Council along with the Federal Government and the Province of Ontario together to expand Toronto’s subway system to Scarborough. This project will bring rapid transit to the 650,000 residents of Scarborough. To pay for the City’s share of this important project, I supported a recommendation to implement a one-time transit levy dedicated to this specific project. Once this project is complete, the levy will be removed, it is not a permanent transit tax. I do not support implementing costly, permanent taxes that are not dedicated to a specific project and are collected under a general transit pool. When Toronto planners envisioned our transit system’s growth in the 1960s they knew that subways were the best way to modernize the City and bring us into the 21st century. Building more subways was the City’s official position until 2003, when David Miller was elected and subway expansion plans were replaced with surface rail. The focus shifted to LRTs. We need to take the politics out of transit planning and leave it to the experts. As new administrations have come in they have changed the plans to expand our subway network. The Ford administration got subway expansion plans back on track. One thing I am very proud of is having Andy Byford at the head of the Toronto Transit Commission. Andy has been working very hard to modernize the TTC and make it one of the best systems in the world. Mr. Byford wants to build more subways and I will give him the resources he needs to make that happen. I am the only candidate who is fully committed to underground transit. Wasting taxpayer money on surface rail won’t fix Toronto’s transit problems. Subways are the only long-term solution. They offer the greatest economic potential and the needed capacity to serve Toronto’s growing population. My plan is the only one that makes sense. I want to replace the planned Sheppard LRT and close the loop by connecting the Sheppard subway to the Bloor-Danforth Extension. I want to build the Downtown Relief Line to alleviate pressure on our overcrowded system; and I want to build the Finch subway line. In 2011, the Ford administration launched the most comprehensive budget review process the City of Toronto has ever undergone. This process resulted in $750 million in efficiency and budgetary savings. One of the important things we did as part of this process was conducting a number of Service Efficiency Reviews including the Core Service Review. While we have implemented a number of the key findings in this report, there are still a many saving opportunities which we have yet to achieve. Once elected mayor I will immediately resume pursuing these opportunities, along with other opportunities to reduce the size and cost of Toronto’s government. 6) Are you in favour of cancelling the Municipal Land Transfer Tax in the City of Toronto? Yes. The Land Transfer Tax is an unfair tax that hurts growing families and seniors looking to downsize their home. Toronto is the only municipality in Ontario that hits homeowners with a Municipal Land Transfer Tax on top of the Provincial one. The Land Transfer Tax works against Toronto’s economic goals. 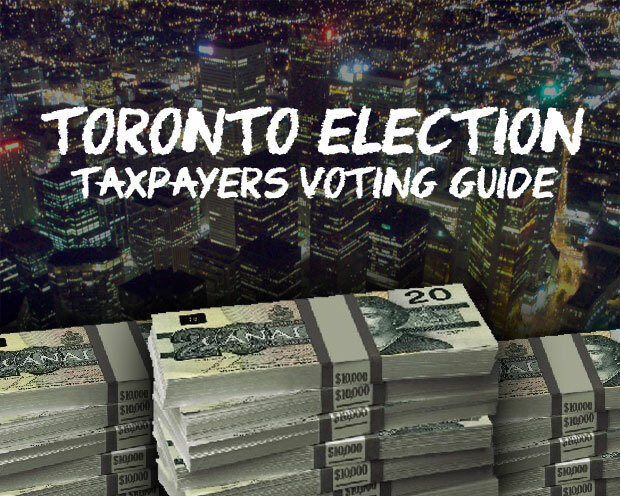 This is money that should be spent by Toronto residents stimulating our economy and creating jobs. This money would be better spent by homeowners, buying new furniture or making upgrades to their home. In 2012, the Ford administration led labour negotiations with Toronto’s powerful public sector unions. These negotiations resulted in record concessions, massive savings and historic labour deals that are fair to our workers and to the taxpayer. By giving our managers the flexibility to reduce costs and improve service delivery, our new collective agreements have helped save over $150 million in direct savings, and hundreds of millions more in efficiency savings. All of this without a single day of labour disruption from our largest unions. Furthermore, by making the TTC an essential service, we have ensured that Toronto will never face another crippling transit strike. The City of Toronto will begin labour negotiations with our major unions again in 2015. I am the only candidate who will take a tough, but fair, stance with our public sector unions during next year’s labour negotiations. John Tory has repeatedly shown that he doesn’t have the consistency or the strength to take a clear position on key issues, let alone stand up to powerful union interests. Meanwhile, Olivia Chow, like David Miller, will always side with unions during negotiations. No politician has experienced the conditions at Toronto Community Housing the way Rob and I have. I am very proud of my record of helping residents in Toronto Community Housing. While we make a point of regularly touring building and inspecting Toronto Community Housing units on a weekly basis, we are also focused on dealing with the issues at the top of TCHC. Although I know there is a lot of work that still needs to be done, I am very proud to say we have made major improvements in the lives of thousands of residents at Toronto Community Housing. The Ford administration has restored public faith in TCHC. Moving forward, my focus is on restoring and maintaining our existing stock and working with TCHC to create more opportunities to expand and grow healthy communities. Paying the interest on Toronto’s debt every year is a major expense. The Ford administration has reduced Toronto’s planned debt by over $500 million. We have done this by implementing an aggressive debt reduction plan. One part of this plan is the surplus management strategy, which invests 75% of Toronto’s annual surplus into capital projects like building roads, transit and maintaing the Gardiner Expressway and 25% into our reserves. This fiscally responsible approach to managing Toronto’s debt load is just one reason bond rating agencies such as Moodies and DBRS have kept Toronto’s credit rating strong, even as they reduced the Province of Ontario’s. Since 2010 I have been focused on creating the conditions to boost economic growth and job creation in Toronto. Toronto’s economy is booming. Since I took office, over 56,000 jobs have been created. The City of Toronto must create the conditions that are conducive to business and investment. An important part of this is keeping taxes low by running an efficient government, having a safe and livable city. And expanding Toronto’s transit and transportation system like building subways, maintaining the Gardiner Expressway and fighting gridlock on our roads. 1. A year ago today saw the beginning in a series of natural weather events that placed an unexpected financial burden on the city. What lessons have you taken away from this to better deal with the financial fallout due to aggressive climate in the future? Toronto needs a mayor who can work with different levels of government and especially so in times of need such as both the floods and ice storm of 2013. Toronto was not prepared for any of the extreme weather events in the last year. As mayor I plan to engage with the provincial and federal governments to ensure an effective and hands on response with more resources, ability, and funds to mitigate weather emergencies and disasters in our city. There are a number of requests that have been made by city council to the provincial government regarding both the 2013 flood and ice storm. Council has widely accepted an independent report on the ice storm – including having the city manager work more closely with Toronto Hydro, ensuring all residents have better information, and working more effectively with emergency responders. 416,000 metered Hydro customers lost power at any given time. For every metered customer there are another 1 -­ 2 persons also affected in the same location. Hydro itself says a million Torontonians with lost power were affected by this storm. As we know, the dictionary defines “resilient” as “capable of withstanding shock and tending to recover from or adjust easily to misfortune or change.” City staff have told us that Toronto’s weather will continue to change with hotter days, more severe storms, and more frequent and intense rainfalls. Electricity capacity issues, especially in the core, remain a serious issue. I support city staff efforts (carried out in 2013), to convene a Resilient City Roundtable to ensure an action plan is in place. Toronto was not as well prepared for either of these extreme weather events. Just one of the specific measures I have proposed is my Tree Canopy recovery program. This effort to renew our depleted natural infrastructure is important from a resiliency perspective. By keeping our trees in place, we use these natural stabilizers to mitigate the negative effects of sudden flooding. I have also made a feature of my recovery plan a public-­‐private partnership involving philanthropy to help ensure that the cost to the city’s taxpayers is minimized. To be even better prepared for future events, a strong relationship must exist among the Mayor, the Premier, and the Prime Minister to be able to get their commitments to improving our emergency response plans. The Province and the Federal Government have the material resources and the funds to plan for these events in a way that Toronto would be more secure in the future. 2. Do you feel that cutting the size of Toronto City Council would improve how council operates? To move forward with good governance at city hall we must do away with polarization in council and bring everyone together to create a positive fiscal agenda in the interest of Toronto. In terms of council size and effectiveness, there is a current process underway, the Ward Boundary Review, being conducted for the City by the Canadian Urban Institute. Since the issues of ward size and boundaries are already on the table the proper place for a discussion of council reform is to have the issues of 1) ward boundaries, 2) a ranked election ballot, and 3) and the size and composition of council all be reviewed at the same time; the process includes citizen input. At the end of this next mayoral term, Toronto will have been amalgamated for almost 20 years. We need to learn from Toronto’s past and take a good look at the opportunities to improve governance as we move ahead. This would mean seeking the input of present and former city councillors, through the office of Speaker, asking each for specific recommendations and ways to improve the effectiveness of Council; the best of that input will be combined with good governance standards. 3. What is your stance on introducing new, dedicated taxes to pay for transit expansion in this City? Transit expansion is absolutely crucial in Toronto, and so we have to find new and creative ways to deal with it -­‐ not new taxes. We do need solutions to Toronto’s congestion problems and that is why I have proposed my SmartTrack plan for surface subway expansion that will ease both city and regional congestion. My plan relies not on a new city tax increase, nor on a new dedicated tax but rather, on working closely with provincial and federal levels of government to keep Toronto moving with minimal burden placed onto the taxpayer. My 53 kilometre, 22 station SmartTrack plan allows us to directly link major employment hubs for the first time -­‐-­‐ major areas of growth include up to 200,000 jobs in Scarborough and the Markham corporate centre, and 200,000 in the far west Etobicoke area and Airport employment centre; we can also link a potential 70,000 new jobs in the East Donlands-­‐Portlands area (the former Unilever site), the new Southcore Financial area, and growing Liberty Village area. Liberty Village, alone, is a thriving and vibrant new neighbourhood, while the Donlands-­‐Portlands area, if revitalized, has the potential for additional 15 million square feet of mid-­‐rise, low-­‐cost office space located close to transit and to the financial core. Linking jobs to transit, and transit to jobs is how we build prosperity, generate wealth, strengthen our economy, and fund the very services we need. The current mayor talks subways but has no plan and time-­‐line, no strategy, or fiscal plan to pay for them. My opponent Ms. Chow calls for an unspecified Relief Line. She has refused to specify a route or a cost, nor has she said one word about how she will pay for it. Worst of all, her plan will not be completed until 2031. My SmartTrack Line will be built in seven years. The development surrounding SmartTrack will create incremental tax revenues that provide the funding into the Toronto tax base that will pay for the municipal portion of the project’s financing. 4. Transit planning has not progressed as it should over the past few decades because of revisiting past decisions and reopening previous debates. How do you feel we can best improve the transit planning process in Toronto? leadership in council and working effectively with other levels of government to ensure that Toronto gets moving. That’s the same approach I will bring to delivering SmartTrack in seven years, not seventeen. 5. Where would you find savings in future budgets? List your top five specific priorities for savings. As mayor, I propose to improve on the efficiency of city operations. If we can have agencies fall in line with council we can further streamline the city functions and how these agencies interact. I would like to eliminate redundancies in the system and improve the flow of business and city functions; the dividend will be significant savings. It’s not just about waste; it’s also about lost opportunity. There are simple ways in which the city can save significant money, and at the same time improve functions. One thing I have spoken about widely, and will do as soon as I am elected, is go right out to our own employees and workers, whether full-­‐time, part-­‐time, or casual, and to all service providers and city contractors. I will ask them all a simple and basic question that will yield 10 solid and thoughtful ideas within city operations to increase efficiency, provide better service, reduce costs, and remove duplication. Over the last four years there have been serious problems and millions in over-­‐budgeting on renovations to Union Station, Nathan Phillips Square, the Sony Centre, and the Peter Street shelter. Large projects in the city need more direct oversight and need to be accountable for every decision made with the taxpayers’ money. As Mayor, I would convene regular meetings with the leaders of the largest projects in the city. I would personally hold each leader to account on their budgets. It may require building in penalties for cost or time overruns. Businesses of all sizes survive by sticking to the budget; I aim to bring that same mentality to Toronto’s leadership. 6. Are you in favour of cancelling the land transfer tax? to balance the books. We can’t have a serious discussion about eliminating this tax until we find a way to replace the money from it. We need to be prudent in the way we manage our finances. It is also important to note that municipalities collect just eight cents on every tax dollar.1 The present Mayor campaigned on a promise to eliminate this tax. After four years, he has still yet to provide any solutions to make up for the short-­‐fall if he were to eliminate this tax. As Mayor, I will work together with the provincial and federal governments to advocate for increased support for municipalities. 7. In upcoming labour contract negotiations, how would you achieve agreements that are fair for both City employees and taxpayers? Council must set targets and stick to them. This includes council’s willingness to not expand into new programs and spending without first having a fully funded plan in place. In order to have fair negotiations Toronto needs a leader who is present, available, and willing to work closely with the public sector. on. In order to address negotiations there needs to be some change in the way council deals with matters. The current confrontational, destructive and adversarial approach has damaged morale and hampered efforts to improve productivity. In the last agreements with CUPE, there were a number of changes including incremental wage increases. There were a number of mandates in the last agreement in 2012 that brought more security to our public sector workers and brought them in closer line with those in the private sector. I would be willing to continue to support our public sector with these endeavours. productivity, and that’s what I will be pushing with council. Accordingly, I will be asking every councillor to concentrate on core programs and services. There are areas that we can and must look at to see where the city can increase productivity and efficiency while also looking after our own workers. 8. How can affordable housing be best managed? Affordable housing is an important issue and I believe the city has an important stake in the matter, particularly because it involves some of our most vulnerable citizens. Under Rob Ford, and his appointee Gene Jones, the TCHC has fallen into chaos and is yet another example of why the city needs new leadership. The Fords may be good at answering phone calls and handing out 20$ bills but they have not provided the leadership or the needed resources to fix the real and significant problems in the first place. We need creative and meaningful change as to how public housing is managed in Toronto. Our housing strategy involves all three levels of government and I am committed to working together to make public housing better. As Mayor, I would work to convince the other levels of government to invest in housing again. Among all of the other candidates for Mayor, I am the best suited to work with the provincial and federal governments to get this done. 9. Do you place a priority on paying down the city’s debt, and what plan would you put forward to eliminate our debt quickly to minimize interest payments? How quickly can you eliminate the debt? Creating economic activity and prosperity is a critical component of generating revenues that will allow us to make larger payments on our debt. Toronto has yet to fully recover from the 2008 financial crisis. Unemployment is 10% and Youth unemployment is near 20%. We should focus our limited resources on the specific components that drive investment: relieving congestion, city wide rapid transit, connecting employment hubs, leveraging provincial dollars as we plan to with SmartTrack, and getting the Federal government on board with a long term infrastructure plan for Toronto. These are the fundamentals we need to prioritize, and then debt repayments become much more achievable. In sum, our city services need to be in good fiscal shape while also facilitating growth and efficiencies to tackle the city’s debt. 10. How would you encourage more private investment in Toronto? To attract more private investment requires an environment that will foster growth and encourage excellence. We need to cut waste and inefficiencies that stand in the way of investment, and, at a very practical level, expedite permit approvals. I will create a single touch-­‐point for business and permit applications and other services sought by those seeking to invest in Toronto. I plan to double the number of foreign investment leads in my first term. In addition, as mayor, I will have the city develop a more effective functional relationship with the Board of Trade, Ethnic Chambers of Commerce, Business Improvements Areas, our financial community, and educational institutions. Investment opportunities need to see the City not as an obstacle but as a partner in growth. high-­‐tech life sciences employment corridor to attract big and small businesses in areas such as software and biometrics. What’s really needed to bring it all together is a new medical school at York University, and I will advocate for that. Combining that with teaching-­‐hospital status for Humber River Hospital and associated community-­‐based health resources we can foster a new high-­‐tech employment hub for northwest Toronto. at the former Unilever site east of the Don River. We need a transit system that supports businesses and one that can handle the demands of large international firms and investors. Finally, we need a more competitive tax regime. At the present, federal and provincial policies have created a strong corporate tax regime in this corner of the globe, and we will build on that advantage as it grows more competitive. I have set out a detailed economic plan that encourages more economic growth by creating more educational opportunities, connecting youth with jobs, combating unemployment rates, and my ambition of creating the world’s first big “smart city”.